Published: Oct. 19, 2012 at 02:46 p.m. 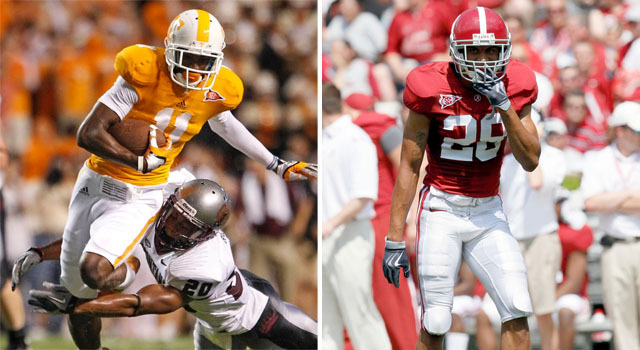 Updated: Oct. 19, 2012 at 08:15 p.m.
Tennessee receiver Justin Hunter (left) will have his hands full with Alabama cornerback Dee Milliner on Saturday. Looking over the weekly college football preview articles I've written this season, it might seem that I have a fascination with the Southeastern Conference. The plain fact is, when you're looking for the top prospects in any particular draft class to watch on a Saturday, SEC stadiums are the place to be. Over the past decade, the teams in the nation's deepest conference have seen more of their players selected in the first round of the NFL draft, as well as the entire seven-round event as a whole. The sheer number of teams is certainly a factor in those trends, as the new 14-team alignment is larger than its main competitors. But 10 of the top 26 colleges nationwide in terms of producing first-round NFL draft picks currently reside in the SEC (see table, right). The Big Ten ranks next with six. That means it's not just the quantity of teams in the SEC making it a fruitful area of the country for NFL general managers to find their next stars, but it's also a matter of quality in the top two-thirds of the conference. So it's not surprising that, once again, this weekend's list of top matchups between future NFL players includes multiple entries from the SEC. Add in an intriguing battle from a rivalry game in the Midwest and a matchup of Big 12 opponents with their eyes on a conference championship, and it should be a fun -- and informative (for scouts) -- Saturday slate of games. 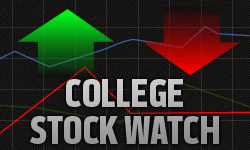 Something has to give in this SEC contest between two of the top-rated units in the country. The Tigers' second-ranked defense travels to face the Aggie's sixth-rated offense in College Station, and NFL scouts will be most interested in watching whether A&M junior offensive tackles Luke Joeckel (6-foot-6, 310 pounds) and Jake Matthews (6-5, 305) can handle the heat coming from junior LSU defensive ends Sam Montgomery (6-5, 260) and Barkevious Mingo (6-5, 240). Montgomery will be a good test for Joeckel, who is more of a technician than a brutish blocker. On the other side, Mingo's speed could be a problem for Matthews (the son of Hall of Fame guard Bruce Matthews), unless he gets his powerful hands on Les Miles' lanky star defender. LSU senior Lavar Edwards is the first end off the bench for Miles, and hopes to show potential future employers he has both the strength to push back Joeckel and the quickness off the edge to beat Matthews throughout the game. Michigan has been impressive this year save two losses to 6-0 teams (Alabama and Notre Dame), but you can bet a win against Sparty would be the highlight of the season no matter what else they might accomplish. If Michigan State wants to win their fifth straight against the Wolverines, and get over a disappointing double-overtime home loss to Iowa last weekend, they'll need Gholston (6-7, 278) to have a consistent overall game against his nemesis in Lewan (6-8, 309). These juniors mixed it up so often in last year's matchup that Gholston lost his cool, throwing a punch at Lewan and twisting the helmet of speedy quarterback Denard Robinson (6-0, 197) to earn a one-game suspension from the Big Ten office. Michigan's athletic and strong left tackle won't let up on any play, so Gholston not only must keep his composure when attacking the pocket as a pass rusher, but also must show scouts he can hold the edge and disengage against a top competitor to bring down the nation's fourth-leading rusher in Robinson (134 yards a game). Lewan's ability to stay in front of Gholston on edge rushes will help his standing with scouts, as well. Michigan right guard Patrick Omameh (6-4, 305) also has a chance to prove his strength to scouts in this game by getting movement on State's run-stuffing nose tackle Anthony Rashad-White (6-2, 330). Two of three teams (along with Georgia) looking for the SEC East division's berth in the conference championship game occupy CBS's coveted Saturday afternoon slot. The key to a Gator win might be the ability of Gillislee (5-11, 209) to duplicate the 34-carry, 146-yard, two-touchdown effort he put forth in the team's last home game, a 14-6 win over defending SEC champ LSU. He accumulated just 920 rushing yards over his first three years in Gainesville, and NFL scouts might not consider him a "plus" back in terms of size or strength. However, he has enough of both of those attributes plus the burst and straight-line speed to break off significant runs when opportunities arise. His offensive line might have a tough time giving him those chances this week. For example, NFL-sized left tackle Xavier Nixon (6-6, 314) will have his hands full with the elite combination of power, length, and speed possessed by sophomore defensive end Jadeveon Clowney (6-6, 256). Add another long and powerful defensive end Devin Taylor (6-8, 267) on the other side of Clowney, active linebackers Shaq Wilson (5-11, 224) and DeVonte Holloman (6-2, 241) and downhill safety D.J. Swearinger (6-0, 210), and Steve Spurrier's rush defense (that gives up just 2.9 yards per rush) has plenty of obstacles for Gillislee to avoid -- and prospects for scouts to evaluate as potential NFL contributors. Even though 'Bama looks to be as strong a candidate to repeat as BCS champion as we've ever seen, it will be no easy feat to walk into Neyland Stadium and stop one of the more proficient passing offenses in the country in front of 100,000-plus screaming fans. As I've mentioned in previous weeks, Tennessee junior quarterback Tyler Bray (6-6, 215) has the arm strength to find his targets anywhere on the field, even when he's falling backward due to defensive pressure. His tall, long junior receivers Justin Hunter (6-4, 200) and Cordarrelle Patterson (6-3, 205), will have their most difficult task of the year, trying to stride past one of the top cover men in the country in Tide junior DeMarcus "Dee" Milliner (6-1, 199) and the rest of a young and talented cornerback group. Milliner not only has the size to start outside in the NFL, but also the speed and ball skills to turn the field around if Bray trusts his arm too much or fails to read Nick Saban's multiple-look defense correctly. Safety Robert Lester (6-2, 210) is also looking for a big performance in this game, as he has just three interceptions over the past two seasons (since racking up eight in 2010). In order to project Lester as an NFL starter, scouts want to see consistent playmaking and discipline in coverage (especially against 6-3, 244-pound tight end Mychal Rivera), as well as tenacity in the run game. West Virginia's defensive shortcomings were apparent against Texas Tech's passing attack last weekend in Lubbock, where the Mountaineers suffered their first loss of the season in embarrassing fashion (49-14). But far more surprising was the dearth of big plays from quarterback Geno Smith (6-3, 220) and his receivers. Electric slot and return man Tavon Austin (5-9, 171) was limited to just 11 yards per catch last week, as was tough outside wideout J.D. Woods (6-1, 190). Junior Stedman Bailey (5-10, 195), who has the most all-around talent as a pure receiver in the group, scored his 14th touchdown on the year, but managed just 56 yards on his six receptions. If Kansas State wants to win their third conference road game in four weeks (in addition to Oklahoma and Iowa State), then undersized but extremely instinctive middle linebacker Arthur Brown (6-1, 231) and the rest of the Wildcats' defense must secure tackles immediately after WVU's receivers make the catch. Cornerback Nigel Malone (5-10, 180) went from junior college to All-American in 2011 by intercepting seven passes and showing good toughness for his size. If Malone can add his third pick this year -- which would be Smith's first throw to an opponent this season -- and display solid tackling skills against those elusive WVU weapons, scouts could be sold on his ability to become a major contributor at the next level, despite average measurements and speed.